Flexitank (Australia) have launched their new 50 litre flexible bladder tanks. Designed specifically for the dual cab HiLux, these new bladder tanks use ‘dead space’ and allow off-roaders to carry fresh drinking water without losing storage space. These flexible bladder tanks are designed to fit behind the back seats of the popular dual cab Toyota HiLux range. Off-roaders can now carry plenty of fresh drinking water without compromising the space they have for other equipment. The flexible water tanks hang from the back of the existing rear seats, in space that would otherwise be considered unusable. This innovative design makes it easy to carry the recommended daily intake of water for a car full of people on a trip of a few days. The design for the HiLux bladder tanks was originally developed for defence purposes in the Middle East. Flexitank have spent two years optimising the design to create one of the most versatile products on the market. 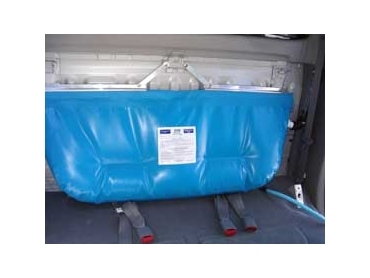 The resulting universal bladder tanks can be suspended from cargo barriers in any vehicle. The bladder is manufactured from Flexitank’s exclusive FT305A PVC fabric. As the most widely accepted material for carrying drinking water around the world it guarantees to leave no plastic taste or residue.